Everyone knows that using coupons is a great way to save money. For me, the problem is that I never seemed to have them when I needed them. The Mr - "Didn't we have $2 off at Baja Fresh?" Zentmrs - "We do - did you bring the coupon?" The Mr - "Nope... did you?" Ugh. Could be that we didn't remember to bring the coupon, didn't remember that we had the coupon or didn't plan to go to the place that took the coupon. Doesn't really make a difference to the pocketbook. How many of us have a stack of coupons, various gift cards and notices of special deals lying around the house in different places? Coupons, special deals and gift cards do no good in the drawer. I use a different process for grocery coupons (a topic for another day) - this is what I use for gift cards and other types of coupons and specials. The first step is to get everything together. Go through the coupons and gift cards and make sure everything you have is still valid. Now you have WITH YOU what you need to save - when you purchase something, quickly scan your list to see if you have a gift card or coupon that applies. You will need to make sure that when you use something or add something that you add it to the list. I do this weekly, when cutting my coupons, but it can be done only as often as makes sense. This has really helped me make sure I can take advantage of all of the great deals available to me! Hope it helps! 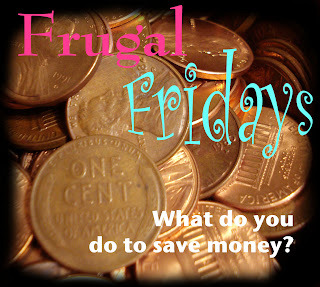 To see more Frugal Friday tips, jump on over to A Sassy Engineer! Great tips! My hubby actually lost some valuable gift cards somewhere in our house, and he is still looking for them. I guess I'll have to keep all of his with mine. We also forget and leave coupons for restaurants at home a lot, but I think I might just have to put them in my purse. I can't wait to hear about how you use grocery coupons!